The following article by myself on the above exhibition at Tate St Ives in the summer of 2008 was published by the St Ives Times and Echo on 23rd May 2008. "The summer season group of exhibitions that open at Tate St Ives on 24th May contains one show that will be of particular interest to local residents. Dawn of a Colony - Picturing the West (St Ives 1811-1888) looks at artists working in St Ives both prior to the establishment of the colony in 1885 and in its formative years. This is not only the first exhibition of early St Ives representational art that Tate St Ives has mounted, but it is also part of a joint project with Penlee House Gallery, Penzance, with that Gallery taking the story of St Ives art up to the First World War, in its exhibition Lyrical Light (St Ives 1889-1914), which opens on 14th June. Both shows run until mid-September. Accordingly, having waited 120 years for the first exhibition devoted solely to the early artists of St Ives, locals are now blessed with two shows running, almost concurrently, throughout the summer. I hope that these exhibitions, and the two books that I am publishing to go with them, will result in a complete re-evaluation of the immense importance, on both the national and international stages, of the early art colony in St Ives. We are all so used to the concept of the beauty of St Ives acting as a magnet for artists, that it is a bit of a shock to find that St Ives, for much of the nineteenth century, was a dirty, noisy, stinking fishing port, surrounded by mining detritus. Indeed, mid-century guide books recommended visitors to avoid it. Accordingly, in the first half of the century, few artists painted in the town. Turner, as is well-known, did a quick pencil sketch in 1811, and this is in the exhibition, and it was clearly Turner’s depictions of the south-west, which were engraved and marketed by the Cooke brothers, that led the marine painter, Edward Cooke, son of the engraver, George Cooke, to make a tour of the south-west himself in 1848. He stayed a week in St Ives in mid-October that year - the longest time that he spent in any one place - and the exhibition contains an engraving of his sketch of 11th October and a watercolour sketch dated 12th October, both done on the beach at Carrick Gladden Cove, now Carbis Bay. These are fascinating, as they show huts on the beach, used for storing fishing gear, with upturned seine boats as roofs! However, the exhibition also contains Cooke’s Royal Academy exhibit of 1853, The Pier and Bay of St Ives, Cornwall, which was sold to the Lord Mayor of London, and which is probably the finest pre-colony depiction of the town. The completion of the rail link to Penzance in 1859 had a major impact on the number of artists visiting Cornwall and the newly elected Royal Academician, James Clarke Hook, spent nearly three months in St Ives in 1860. Three of his RA exhibits of 1861 were St Ives scenes and the exhibition includes one of these and an etched version of another. Hook’s main models came from the Perkin family - Daniel Perkin, his wife Mary, and children Mary and Daniel, and his father John - and so if anyone is related to this family, please make contact with me. The etching of Hook’s work, Sea Urchins, showing two boys fishing on a mooring block in the harbour, was said by his biographer to feature a member of the Painter family - he no doubt meant ‘Paynter’ - , who drowned at sea with his father, and a member of the Bowlings family, who rose to be a skipper. Bowlings is not a known St Ives name. Cowling would be my guess. Again, if you think that you could be related, do make contact. 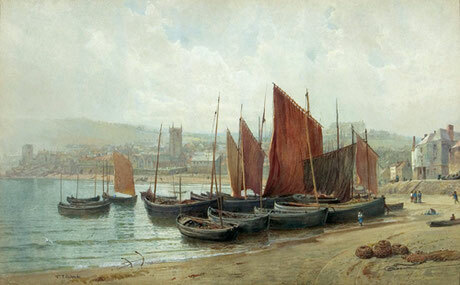 In addition to Hook, the exhibition also showcases some major Cornish works by John Brett and Henry Moore, the two leading marine artists of their day, who did much to publicise the attractions of the Cornish coast, and the juxtaposition of these works against the backdrop of the view from the Gallery makes a special combination. 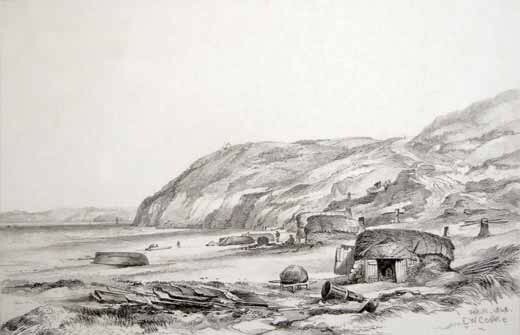 The exhibition contains a number of topographical watercolours, which will be of interest, as some feature the old wooden pier, commenced in 1864 and never finished, the original stone pier, ending with the ‘pepperpot’ lighthouse, without the arches in it, and the mine engine house on Pednolva Point, from which it was hoped in 1860 to mine under the sea. This operation folded fairly quickly, but the mine engine house was used as a quaint feature by artists, with some even romanticizing it into a castellated turret. It later became one of the early studios, occupied by such artists as Eardley Blomefield, Moulton Foweraker and Millie Dow. The collapse of the mining industry in the 1870s led to St Ives needing to re-invent itself as a ‘health resort’, but, despite at last getting a rail connection in 1877, it took some time for it to lose its tag as "a dirty fishing town". However, by the early 1880s, the number of artists visiting increased and, of course, James Whistler, and his two pupils, Walter Sickert and Mortimer Menpes, stayed during January 1884. Some examples of their work are included in the exhibition. However, the establishment of the colony in the winter of 1885 resulted from the visits of the French artist, Émile-Louis Vernier, who alerted various artists in the Breton art colony of Concarneau to the attractions of St Ives. First to arrive and settle in the town were Henry Harewood Robinson and his Irish wife, Dorothy, and they were joined in 1886 by a party of Americans, led by Edward Simmons. Also in St Ives in the summer of 1886 was Stanhope Forbes , and his new Canadian fiancée, Elizabeth Armstrong, and Forbes’ depiction of a house in Digey Square (now Bumbles Café), entitled Their Daily Bread, is included in the exhibition, along with his sketch of bathers and bathing tents on Porthminster beach. The group of artists that painted together in St Ives in 1886 enjoyed their time so much that they returned in 1887, with further friends from Brittany, including Adrian Stokes, who had shared a studio in Concarneau with Edward Simmons, and his Austrian wife, Marianne. Marianne invited her friend, Helene Schjerfbeck, a Finnish girl that she had met in Paris, to join them in St Ives, and, as Helene did not speak much English, they tended to work together, sharing the same models. One of these was later described by Adrian Stokes as the best child model that his wife ever had, as, because she was so naughty at school, her teachers were delighted when she stayed away! This girl featured in Schjerfbeck’s celebrated St Ives painting, The Convalescent, and a profile of her by Schjerfbeck is included in the exhibition, along with a painting of Chicken Amongst Corn Stooks, originally owned by Adrian Stokes, that has recently been bought by Penlee House Gallery & Museum, Penzance. Of all the early foreign artist visitors to St Ives, the one to achieve the greatest international acclaim was the Swede, Anders Zorn, who arrived in late October 1877. He was already a highly regarded watercolourist and the show contains his large, famous watercolour of a fish sale on St Ives beach. Simmons tells us that Zorn, who stayed at 12 The Terrace, had left this on a hedge to dry, but failed to notice that it had started raining. Everyone thought the painting was ruined, but Zorn had merely remarked, "Now I can make a good picture", and had turned the raindrops into footprints in the sand. When the painting was later exhibited at the Grosvenor Gallery, the critics praised the naturalness of the footprints! However, it was in St Ives that Zorn, with the aid of Edward Simmons, first learnt to paint in oils, and the exhibition also contains a lovely, freely painted oil sketch of the head of a fishwife, Old Anne, a model, who is reputed to have sat for Schjerfbeck as well. 1888, the year that brings to an end the Tate show, saw the fledgling art colony in St Ives achieve remarkable success. Helene Schjerfbeck’s The Convalescent was bought by the Finnish Art Society, Anders Zorn’s Fisherman, St Ives won a Mention Honorable at the Paris Salon and was bought by the French Government and Adrian Stokes’ Upland and Sky (included in the exhibition) became the first painting by a St Ives resident to be bought for the nation by the Chantrey Trustees. When, the following year, St Ives works by Adrian Stokes, Edward Simmons, Howard Russell Butler and Helene Schjerfbeck won medals at the Paris World Exposition, which, as it marked the centenary of the French Revolution, was the most prestigious exhibition of the decade, the art colony at St Ives had secured for itself a significant reputation on the international stage, which was only to grow over the next quarter century - the period covered by this summer’s shows. The exhibition at Tate St Ives, therefore, contains much that will interest locals and I do urge everyone to visit it, as, clearly, if the people of St Ives demonstrate that such an exhibition is warmly received, there will be a better chance of having further representational art shows in the future."